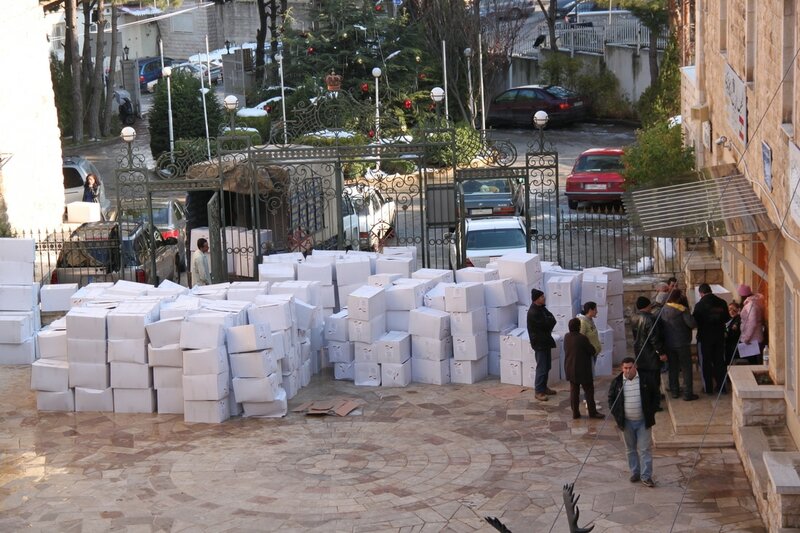 Since the beginning of the war in Syria, and when the refugees started to flee to Lebanon, the Archdiocese created the social office who took in charge to help the Syrian refugees who came to Zahle and the region, it started to help 850 families and now it is helping 650 Christian Syrian refugees’ families (average of 3000 persons), because some of them went back to their homes in Syria, and some travelled to Europe, Australia and others foreign countries. These families are only helped by the Archdiocese. Since they don’t live in camps, they are invisible for all international organizations. Food packages: Inside these packages all the basics of food were present, and the families appreciated that they met their needs, having been taking into consideration their specific demands.These are added to the free hot meal offered daily by “Saint John the Merciful table”. Hygiene items: Inside the packages we find: Shampoo, soaps, trash bags, Clorox, Kleenex, Flash, wipers, fibers…. Household items: The houses are empty; we provide them all items needed to be able to live decently. 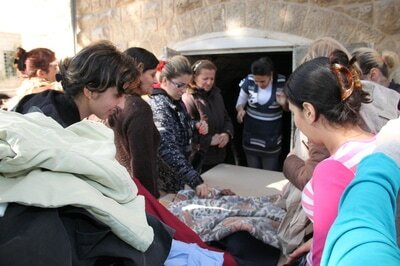 Blankets and mattresses: They are distributed every three months to the families who need them, specially to the newly arrived. Diapers: Diapers are distributed to all children, as well to all elderly who need them. Primary medical assistance: It consists of giving the needed money to buy medications and visit the doctors, is very essential for these families who lack of insurance and money. Secondary care assistance: By lack of insurance and coverage of the UN as well, the Christian Syrian refugees need help to be able to be hospitalized (secondary care assistance). The Archdiocese, through Tel Chiha hospital contributed in paying the invoices of hospitalization to the families. Government dues payments: The new regulations of the Lebanese government insisted that each person should pay $200 per 6 months to be able to stay legally in Lebanon. The Archdiocese therefore helped some of these families in paying 200$ per person. Scholarships for students: The tuitions of the students who attend Lebanese schools are paid by the Archdiocese. As well, the Archdiocese created an afternoon school “remedial classes” to the Syrian students who couldn’t do the Lebanese curriculum. Summer camps for children: Yearly a summer camp is organized during a period of 2 months, for 350 children. Mazout for heating: We distribute $200 of Mazout per family during November-December-January and February (the coldest months of the year). Heating systems: Yearly, all families receive one heating system. As usual, the Archdiocese takes into consideration, along with the humanitarian aid, all the social, psychological and spiritual aspects that are very important for the families to help them survive their hard times. These families were coached as well on the psychological level by specialized psychologists and special sessions. Multiple gatherings and trips were organized for the families. Our priests were involved, and were very active in helping these families on the spiritual level by visits to their houses, evangelical evenings that took place at their houses, and masses at the church of the Archdiocese organized with them. The burden is very big on the Archdiocese, and without help, the Archdiocese wouldn’t be able to achieve its mission towards the refugees in dire need. We are extremely thankful to all our benefactors! We count on them always to go the extra mile!